Undefined function 'gcp' for input arguments of type 'char'. Also, I had many problem by trying to use the PreprocessedDemoData on my computer - by using DPARSF and DPABI and by loading the .mat file you suggested on this website ("DPARSF_Preprocess_ALFF_FC.mat") - to calculate ALFF/fALFF/Functional Connectivity. 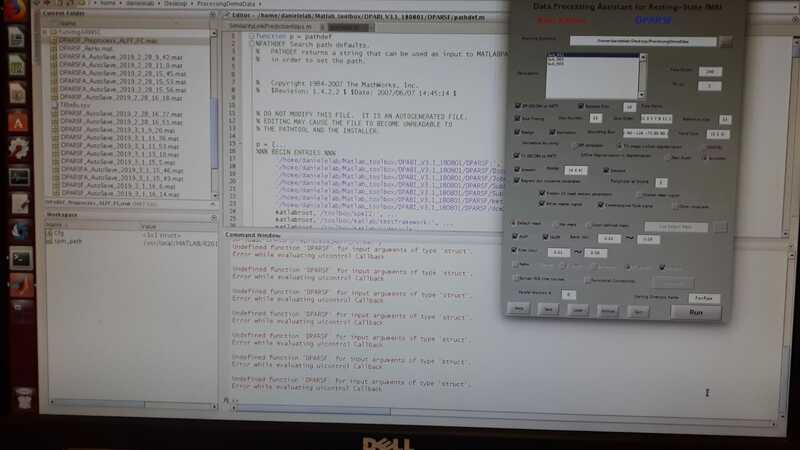 I attached a picture in which you can see the Matlab error. I have Matlab 2013a, DPABI 4.0, REST 1.8 and SPM12. Might these errors concern an issue with compatibility?